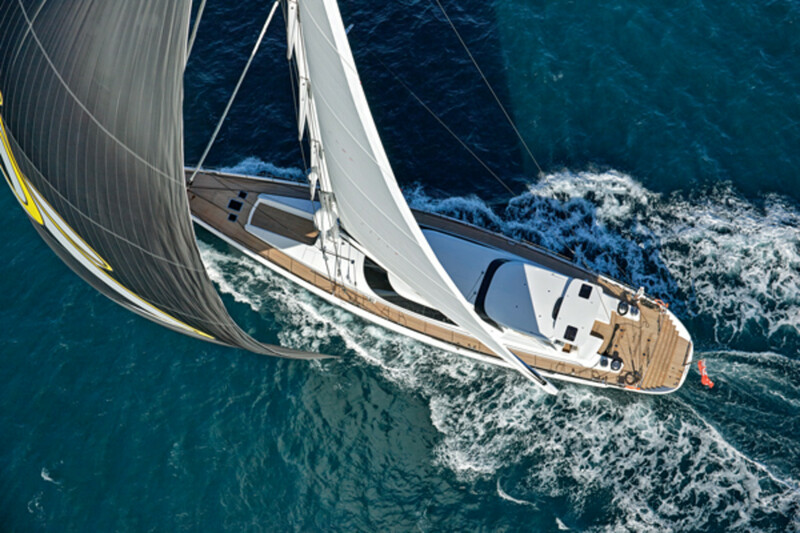 Vertigo (with that capital “V”) is a 220-foot (67.2-meter) ketch that was built right here in Auckland by Alloy Yachts, which had just launched Encore, a smaller, much more traditional 144-footer (43.9-meter) that was docked at the Viaduct Events Centre for her final fit-out and commissioning. Alloy’s Encore: a modern supersailer with a retro flair. Taking a walk around Auckland’s Sky Tower on street level is neither strenuous nor difficult. Doing it on the circular gangplank on top of the revolving restaurant, 630 feet above ground, is a different story. Granted, one doesn’t have to dodge cars that are driving on the “wrong” side of the street, but there is that tiny issue of vertigo to deal with. And vertigo (albeit with a capital “V”) came to mind, once the nerves settled down a bit, permitting the eyes to take in the magnificent surroundings that include the famous Viaduct Basin down in the harbor. Vertigo (with that capital “V”) is a 220-foot (67.2-meter) ketch that was built right here in Auckland by Alloy Yachts, which had just launched Encore, a smaller, much more traditional 144-footer (43.9-meter) that was docked at the Viaduct Events Centre for her final fit-out and commissioning. 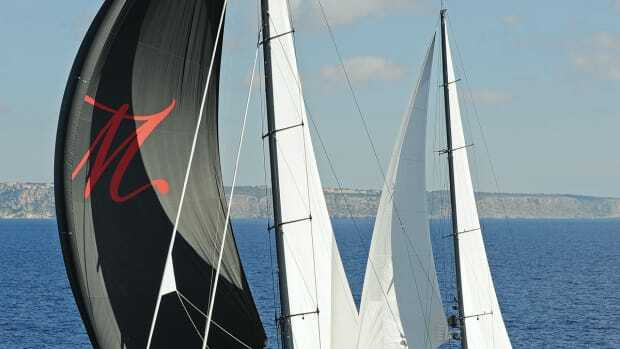 This spot is normally reserved for America’s Cup heroes, but with Emirates Team New Zealand tilting at windmills in California, trying to bring the Cup back to Auckland, Encore and her towering 177-foot (53.9-meter) rig had the stage all to herself. As lovely as it was to look at her from high up in the Auckland sky, her subtle and slightly conservative elegance comes into full view during a dockside inspection and walkthrough. Yes, there are the sleek Oyster-style wraparound salon windows, which are nearly too en vogue these days, not to mention the carbon stick by Southern Spars that’s held up by weight-saving EC6 carbon rigging—and all the requisite electronics and hydraulics tucked away inside her hull. But setting her apart from the common fashion fads of contemporary styling is that retro bent with aesthetically pleasant proportions that artfully conceal her hull volume, highlighting several practical design details instead that include a pronounced bow overhang and flare, just as it used to be in the good old days. 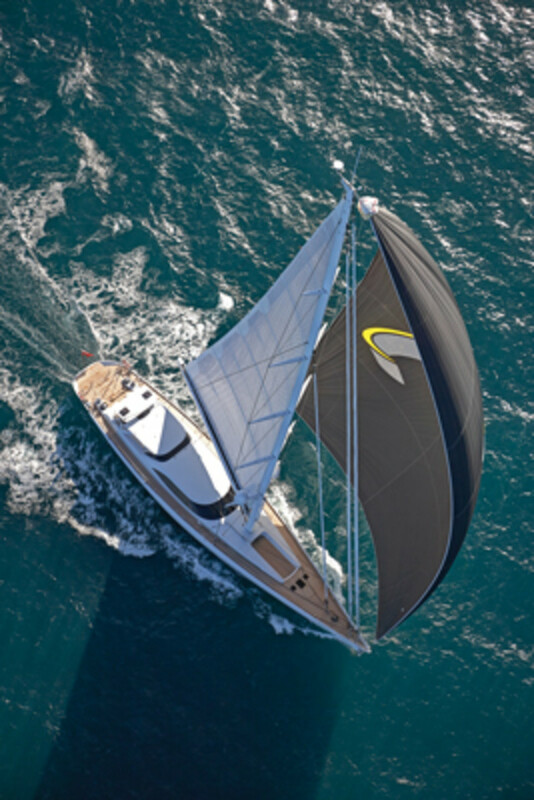 Both features conspire to provide a dry(er) ride in rough weather and a mellow, more predictable demeanor sailing downwind in large seas, not to mention the unproblematic stowage of two plow anchors in their hawseholes and staying clear of the chain rode when the hooks are down. 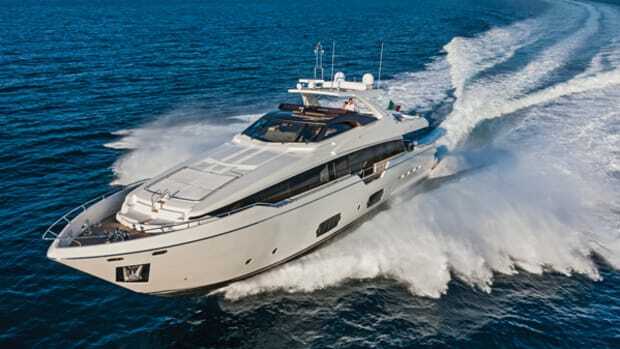 A raked bow might cost an inch of speed, but it brings miles of comfort. 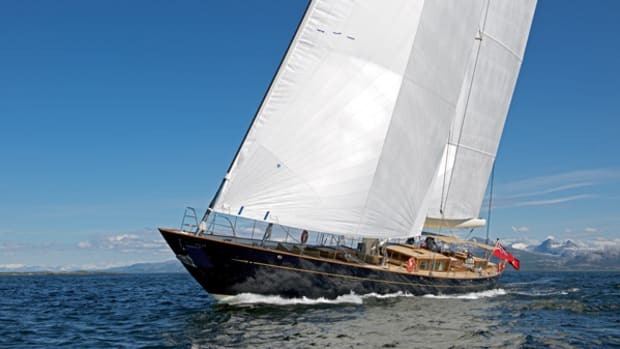 And the latter trumps the former for the owner who also owns Eclipse (formerly Esprit), an Alloy-built sloop that was launched in 1991 and looks like she informed some of the design decisions on Encore. But that does not mean the new boat is a slouch. 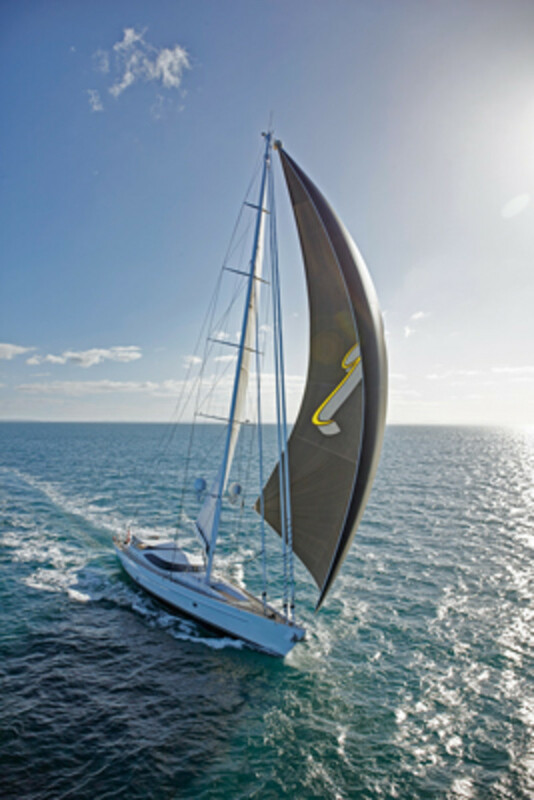 “We did 13 knots in 16 knots of breeze, hitting a top speed of 15 without stress,” says project manager Greg Yeo, who was on board during the sea trials and trimmed the gennaker with two of the four custom AY-400 winches on the back of the boat. 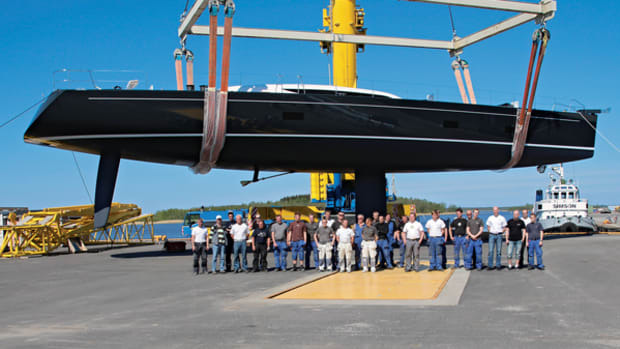 Together with three under-deck captive winches that handle the in-boom mainsheet and the main halyard, these massive verticals (manufactured in-house by Alloy) help manage more than 20,000 square feet of total canvas that was supplied by the local Doyle loft. 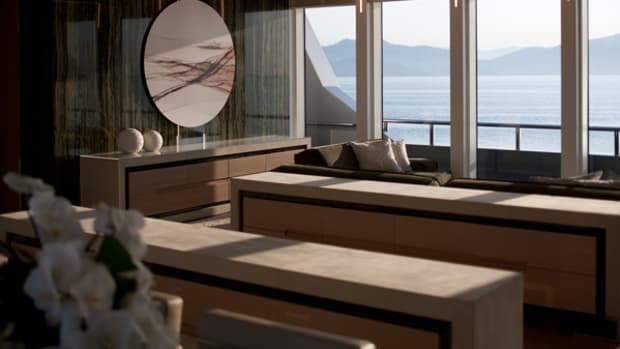 They used Stratis laminate and covered it with a layer of taffeta to increase longevity in the high humidity of the South Pacific, where Encore will do her initial cruising. If the breeze fails, there is an 873-horsepower Caterpillar engine that drives a Hundested feathering prop. 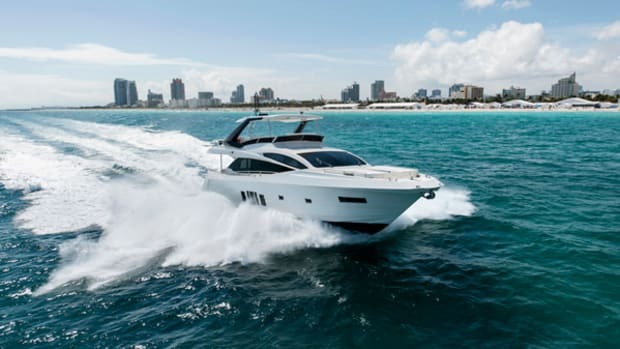 The fuel capacity of 6,400 gallons gives the boat a range of 4,000 miles under power, which is good enough for an Atlantic crossing from New York to Oslo and then some. The boat also is fitted with a traditional rub rail, a delicate rendition of a classic workboat feature. It was added for practical reasons, Yeo points out, to prevent the occasional small ding from marring the hull. And the retro theme that started at the bow carries aft, all the way to the transom steps that span the entire width of the stern. “We did these 20 years ago,” says Yeo. “They’re great, because the steps open up the boat for sitting, lounging, fishing and other activities, which you couldn’t do if there was a large transom hatch.” For toy storage there is a smaller hatch in the steps, while the tender lives on the foredeck in a dedicated recess of the coachroof. 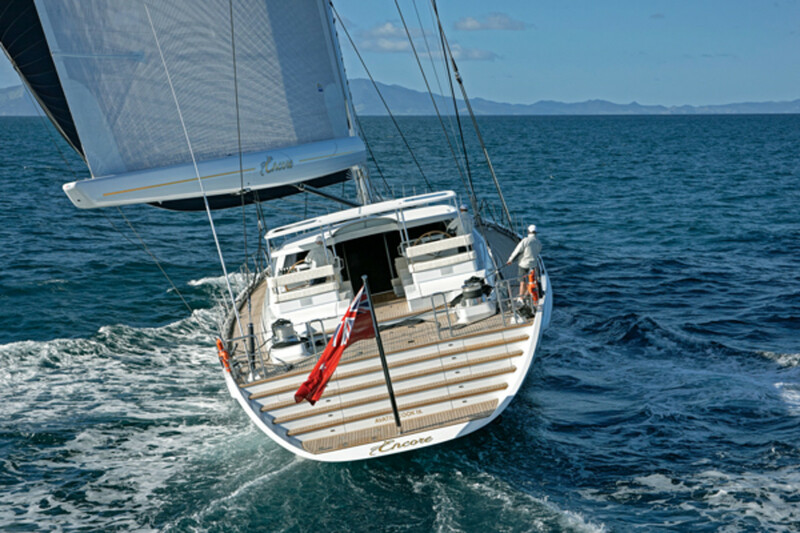 Consistent with the high regard for sun protection in the southern hemisphere’s thinned-out ozone layer, Encore is fitted with hard biminis that shade the large cockpit lounge and two steering stations. Despite the boat getting commissioned with technicians crawling all over and Alloy’s brass assembled on board to supervise the process, there was enough indication of what the atmosphere might feel like once it is fully furnished and decorated to the owner’s liking. “New York gentleman’s club” is what his wife called the décor, keeping with the traditional theme. Darker surfaces of walnut interspersed with ash and teak dominate with granite and marble installed in high-use areas. There are four luxurious staterooms with ensuite heads for a total of 10 guests and three crew cabins fitted with bunks and heads. 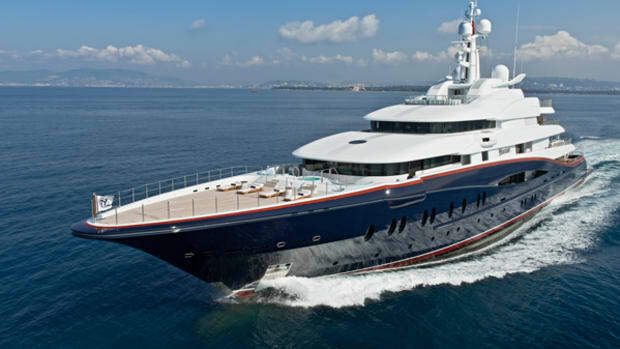 Encore had been handed over to her owner’s representative Jono Wishart on June 18, but she was still docked in that famous spot in Viaduct Basin to be provisioned, fitted and furnished for her first journey. Back up on the Sky Tower, Encore’s silhouette, which reflects a return to traditional and commonsense styling, was blurred by the distance. 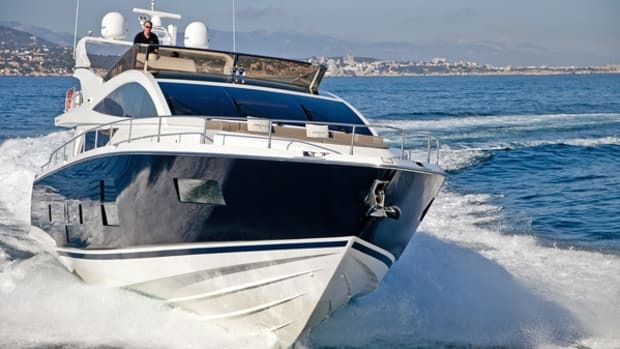 Still, it was quite clear that this boat is a departure from the overwhelmingly masculine mien of Vertigo that was launched by Alloy in 2011 and won a treasure trove of awards. 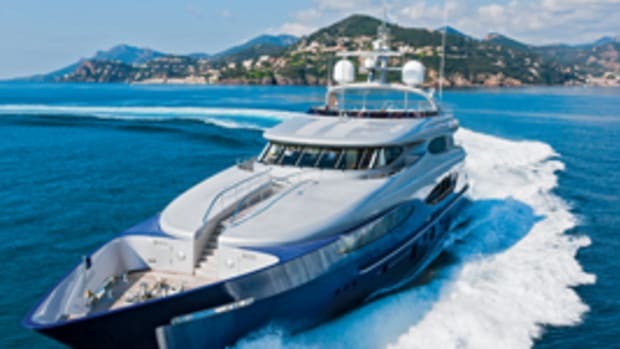 During the return to the accustomed street level, personal vertigo was already a distant memory as the brain stopped panicking and started asking legitimate questions again—not just about the point of being up there, but also about Encore and how she might fare in the various contests on the water and in the prestigious superyacht awards. Will jurors look kindly upon her flirtation with the past and all the pretty and practical details that has wrought? One sure would hope so.